Think summer camp is only swimming, horseback riding and playing sports? 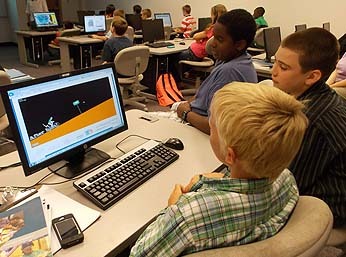 Dozens of middle schoolers around Hampton Roads spent a week of their summer building mobile apps at the Advanced Technology Center as part of a Tidewater Community College Workforce Solutions summer camp. Using MIT App Inventor, students created the app of their choice, presented its advantages, discussed its shortcomings and demonstrated the app, all in five days. Dylan Bowerman created an app testing students on their knowledge of recycling, Kai and Nina Loree designed an app called Zombie Escape aimed at teenage boys, and Joe Donoghue, Ricky Soto and Benjamin Brotman created a weather trivia app. In addition to their own apps, the budding coders and designers each suggested apps they’d like to see invented. Among them were an app to find the remote, an app to turn an android phone into an iPhone and an Angry Birds app incorporating a food fight. Johnna Coleman-Yates served as camp director and Jody Strausser, an information technology professor at TCC, and Paula Bonadies, a technology resources teacher for the Portsmouth Public Schools, provided direction.